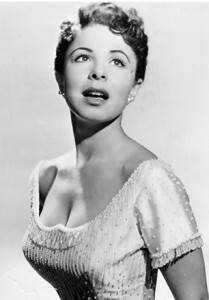 Eydie Gormé (also spelled Gorme) August 16, 1928 – August 10, 2013 was an American singer who performed solo as well as with her husband, Steve Lawrence, in popular ballads and swing. She earned numerous awards, including a Grammy and an Emmy. She retired in 2009, and is survived by Lawrence who continues to perform as a solo act. Gormé was born as Edith Gormezano (census sources indicate Edith Garmezano) in The Bronx, New York in 1928, the daughter of Fortuna and Nessim Garmezano. Her father was a tailor. She was a cousin of singer-songwriter Neil Sedaka. Her parents were Sephardic Jewish immigrants, her father from Sicily and her mother from Turkey. She graduated from William Howard Taft High School in 1946 with Stanley Kubrick in her class. Gorme worked for the United Nations as an interpreter, using her fluency in the Ladino and Spanish languages, while singing on Ken Greenglass’ band during the weekends. In 1953, Gormé made her first television appearance, and met her future husband, when she and singer Steve Lawrence were booked to the original The Tonight Show, hosted by Steve Allen. In 1958, they starred together in The Steve Lawrence-Eydie Gorme Show, a summer replacement for the Tonight Show. During the 1970s, the two made guest appearances on The Tonight Show Starring Johnny Carson with either Eydie appearing as the guest and going into her song with Steve suddenly coming out from backstage and joining her, or the other way around. Gormé and Lawrence were married in Las Vegas on December 29, 1957. They became famous on stage for their banter, which usually involved tart, yet affectionate, and sometimes bawdy, references to their married life, which remained a feature of their live act. They had two sons. In 1995, Gormé and Lawrence were honored for their lifetime contribution to music by the Songwriters Hall of Fame. Gormé died on August 10, 2013, six days shy of her 85th birthday, at Sunrise Hospital & Medical Center in Las Vegas following a brief, undisclosed illness. Her husband, Steve Lawrence, was at her bedside, along with their surviving son, David. She is also survived by her granddaughter. “Eydie has been my partner on stage and in my life for more than 55 years. I fell in love with her the moment I saw her and even more the first time I heard her sing. While my personal loss is unimaginable, the world has lost one of the greatest pop vocalists of all time.” – Steve Lawrence after her death.